Iteca Caspian LLC - 25 years of success! The International Caspian Oil & Gas Exhibition and Conference, the largest energy event in the Caspian region, marks its 25th anniversary this year. The exhibition will be held from the 29th of May to the 1st of June at Baku Expo Center. Over the 25 years of its successful operation, this first trade event in Azerbaijan has become the main industry forum. Every year Caspian Oil and Gas gathers leading experts and leaders of the oil industry to demonstrate advanced technologies of oil and gas production and processing, transportation, logistics, and services. This year’s Anniversary Caspian Oil & Gas coincides with several significant dates; among them is the 95th anniversary of the birth of the National Leader of Azerbaijan Heydar Aliyev who was the inspirer of this exhibition project. The first exhibition was held in 1994 on the eve of signing the “Contract of the Century” in September of the same year; an agreement which defined the main development areas for the Caspian Basin's hydrocarbon resources and opened a new chapter in Azerbaijan’s oil history. Another significant date which coincides with the Anniversary Caspian Oil & Gas Exhibition and Conference is the celebration of the 100th Anniversary of the Independent Democratic Republic of Azerbaijan (on the 28th of May 1918, Azerbaijan declared its independence and established the Democratic Republic of Azerbaijan, ADR); this momentous event will be part of the exhibition programme. The participation of the President of the Republic of Azerbaijan Mr. Ilham Aliyev in the exhibition’s opening ceremony testifies to its high status. The Ministry of Energy of the Republic of Azerbaijan and the State Oil Company of the Republic of Azerbaijan (SOCAR) both show invaluable support for Caspian Oil & Gas. The exhibitions and conference are organised by Iteca Caspian and its partner ITE Group. As is the tradition, 40% of the exhibition area at Caspian Oil & Gas is occupied by world-famous companies that are its permanent participants of the event. Among them are SOCAR, BP, Total, Statoil, Petkim and many others. The regular exhibitors include the national stands of Russia and Italy. This year the exhibition will be attended by companies from Azerbaijan, Canada, China, Great Britain, Germany, Georgia, France, Iran, Italy, Kazakhstan, Malaysia, Russia, Spain, Turkey, Ukraine, Uzbekistan, and many others. The companies will present a wide range of equipment, services, innovative technologies for oil production and transporting energy resources, storage systems for oil and gas, platforms and floating drilling rigs, pipe laying and pipe security systems, and services. The event’s status is reaffirmed by its line-up of leading Azerbaijani companies and leaders in the oil and gas industry sponsoring the exhibition and conference. Traditionally Caspian Oil & Gas exhibition’s Platinum Sponsor is SOCAR, the Gold Sponsors is BP and Statoil, and the Silver Sponsor is Turkish Petroleum. Among the Bronze sponsors are Azeri MI, AZFEN, Baku Steel Company, BOS SHELF, Caspian Drilling Company, Caspian Marine Services (CMS), RussNeft, SOCAR Polymer, Tekfen Construction. An important part of the event’s business programme is the International Caspian Oil & Gas Conference which will be held from the 30th to the 31st of May at Fairmont Baku Hotel; annually, the conference welcomes over 500 top managers of leading companies worldwide, along with representatives of line ministries and well-regarded industry experts, and offers the opportunity to exchange views on topical issues with regard to the development of the oil and gas industry. The status of the event is also emphasized by the sponsors of the conference. The Platinum Sponsor is SOCAR. The Golden Sponsor of the conference is BP, Statoil and Petronas, the Silver Sponsors - INPEX, McDermott, and the Bronze Sponsors - EGS, EY, Dentons, Lamor Corporation, Nobel Upstream, SOCAR AQS, Total, and Turkish Petroleum. This year’s Caspian Oil & Gas will be even more exciting and saturated, and in view of the 25th anniversary of the Caspian Oil & Gas Exhibition and Conference, the organisers plan to implement a programme of additional events. Today Caspian Oil & Gas is a well-deserved recognition of the triumph of Azerbaijan’s Oil Strategy which was founded by the National Leader of Azerbaijan Heydar Aliyev and is successfully pursued by the President of the Republic of Azerbaijan Ilham Aliyev. 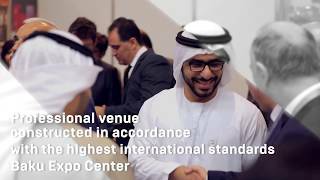 The organisers are confident that the exhibition, which has now crossed the 25-year threshold, will remain the calling card of the achievements in the regions’ oil sector and will continue to serve as an ideal platform for establishing business ties, while providing new opportunities for mutual cooperation. All detailed information about the exhibition and conference, as well as an electronic invitation ticket to the exhibition is available on the websites www.caspianoilgas.az and www.oilgasconference.az.